The antithesis of the Atlantic coast, the Gulf coast operates on a much quieter, more relaxed pace. Everything that Miami is, places like Naples and Marco Island are not. However, they are only a couple hours’ drive apart, so the climate and beach mentality are shared between South Florida and Southwest Florida. This guide profiles the roads of Marco Island, the northernmost of the Ten Thousand Islands chain that sit offshore from Collier and Monroe Counties in Southwest Florida. Marco is the last outpost before reaching the vast Everglades wilderness. A vacation destination and retiree haven, Marco and Naples became wealthy over the years as more retirees moved to the region. However, with the ongoing growth, the relaxed pace accelerated somewhat over the ensuing time period. Marco Island was developed starting in the 1960s. It was aggressively marketed to retirees in the northern part of the United States planning to relocate in the tropical climate of Florida. As a result, prospective residents plotted the location of their dream houses for their retirement, and they moved to the island in droves. Originally, the entire island was to be developed, but environmental restrictions prevented complete development of Marco Island. Impacts were nonetheless present on Marco Island with man-made canals crisscrossing the island, ensuring that each home has boat access to reach the Marco River and Gulf of Mexico. The roads on the island conform to a typical suburban feel, with cul-de-sacs and ranch-style houses with a Florida appeal. Canals flow in between the roads. The Deltona Corporation spear-headed the development and construction of the island, with continued efforts beyond the initial build out. With the demand for beach front property, condominiums arose on the island, especially against the Gulf of Mexico. These high rises are sometimes owner occupied, but they are frequently rented out on a weekly or monthly basis to vacationers, locally known as “snowbirds.” The busiest tourist season is between Christmas and Easter, which includes the various college spring break periods. Nearby Naples has equally grown at an amazing rate through the years. Similar to other mid-size cities, city leaders have wrestled with determining what kind of city they wanted Naples to be. As such, Naples ranges from the extremely high end to the mid-range, with expansion outside the city of golf course developments, condominiums, and large estates. The bulk of the best shopping regionally may be found in Naples, and the walkable downtown features several boutiques and specialty shops. Approaching the Southwest Florida region from the east via the Everglades Parkway (Alligator Alley), Interstate 75 provides the most direct route to Miami from Florida’s Gulf Coast. Interstate 75 also leads north toward Fort Myers, Southwest Florida International Airport (RSW), Port Charlotte, Venice, Sarasota, Bradenton and Tampa. Interstate 75 originally ended in Tampa, with construction underway in the 1970s and 80s to extend the route south to Naples and east across the Everglades to Broward County. The portion between Corkscrew Road (Exit 123) and SR 78 at North Fort Myers opened first by late 1979. The subsequent section lengthened I-75 southward to CR 846 (Exit 111) in July 1981. Signed as SR 84, Alligator Alley, the two-lane toll road connecting Naples with Sunrise in Broward County, was expanded to Interstate standards starting in July 1986. 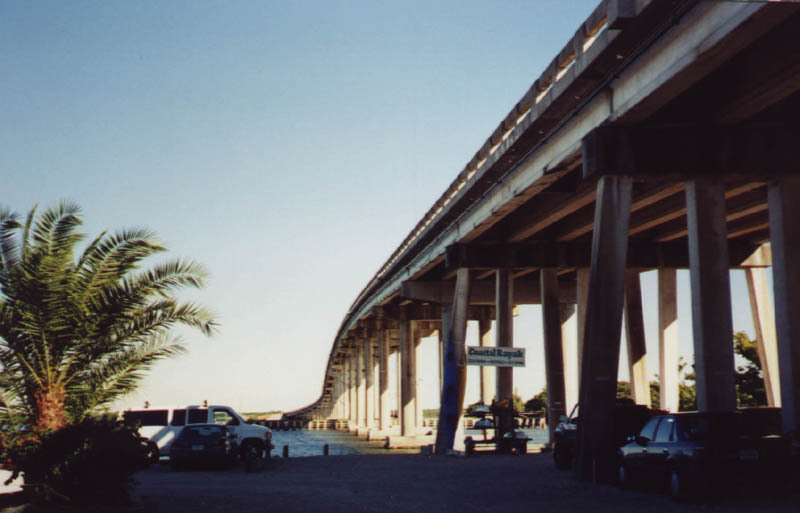 The upgrade to four lanes was finished in November 1992. A new parclo interchange opened to traffic at Golden Gate Parkway (CR 886) on March 13, 2007. The exchange took three years to build and cost $27 million.2 The 2040 Long Range Transportation Plan (LRTP) specifies the addition of a new interchange along Alligator Alley at Everglades Boulevard. Following Tamiami Trail, U.S. 41 generally serves local and commuter traffic from Naples northward to Bonita Springs, Estero and Fort Myers. The route east from Naples and the Marco Island and Goodland vicinity provides an alternate through route across the Everglades to South Florida. All of U.S. 41 is a six-lane arterial from Sonoma Boulevard northward. East across the Everglades, the US highway remains two lanes, with expansion not possible due to environmental impacts. Prior to 1950, U.S. 41 ended in Naples, with the east-west leg across the Everglades and into Miami signed as U.S. 94. U.S. 41 overtook all of U.S. 94 east to U.S. 1 outside Downtown Miami. SR 84 extends west from SR 951 (Collier Boulevard), just south of the exchange with I-75 and the west end of Alligator Alley. Following Davis Boulevard, a four to six lane suburban arterial, the 6.46 mile section of SR 84 ends at U.S. 41 (Tamiami Trail) outside Downtown Naples. Formerly a continuous route across Everglades Parkway, a second section of SR 84 remains posted along the frontage road system of I-75 and Interstate 595 (Port Everglades Expressway) in Broward County. However of the 28.45-mile route in Broward, only 3.61 miles remains in the state system. This section branches northeast from Canal Road, near the I-595 interchange with U.S. 441, to U.S. 1 in Fort Lauderdale. End shield for Florida 84 at the western terminus with U.S. 41 / Florida 90 (Fifth Avenue) to the southeast of Downtown Naples. Photo taken 12/26/04. Second photo taken 01/06/01. Florida 951 and Collier County 951 form the main route from I-75 and U.S. 41 south into Marco Island. Collectively totaling 16.84 miles, state maintained sections of Collier Boulevard include 7.07 miles of the arterial from the Judge Jolley Bridge over Big Marco Pass north to U.S. 41 and the 0.64 mile segment at the diamond interchange with I-75. The route formerly extended south to San Marco Road (old Collier County 92), residents’ beach on Marco Island. Collier County 31 (Airport-Pulling Road) is an arterial that parallels U.S. 41 and Interstate 75. Stemming north from U.S. 41 as a bypass of Downtown Naples, Airport-Pulling Road travels to Naples Municipal Airport (APF) and Immokalee Road (CR 846). The road is named after John Pulling, Sr, a prolific land investor in Collier County’s history5. An unsigned spur of CR 31 follows a stair stepped route south from U.S. 41 along Bayshore Drive, Thomasson Drive and Hamilton Avenue south of Naples. The alignment connects with the Bayview Park boat ramp. Collier County 92 follows San Marco Road for its entire length. The route is unmarked in Marco Island. Constructed in the late 1960s as State Road 92, San Marco Road crosses the Goodland Bridge, one of two spans connecting Marco Island to the mainland. CR 92 provides the most direct route from the island east to U.S. 41 (Tamiami Trail) within Collier-Seminole State Park. Beyond the Goodland Bridge across the Big Marco River, Collier County 92 curves northeast across the mainland toward U.S. 41. Canals and other waterways permeate the area as the gulf gradually gives way to swamp land. Photo taken 12/31/03. These power lines parallel Collier County 92 for its entire length. Through the estuaries, there are several poles that are higher than the others. These support nesting areas for birds, including the occasional bald eagle. Photo taken 12/31/03. One of the last orange U.S. 41 shields was located just ahead of U.S. 41 on Collier County 92 north. Photo taken 12/31/03. CR 92 (San Marco Road) concludes at U.S. 41. U.S. 41 south traverses the Everglades east across Big Cypress National Preserve and Everglades National Park to South Florida and Miami. U.S. 41 northwest leads to suburban areas on the outskirts of Naples to CR 951. Photo taken 12/31/03. 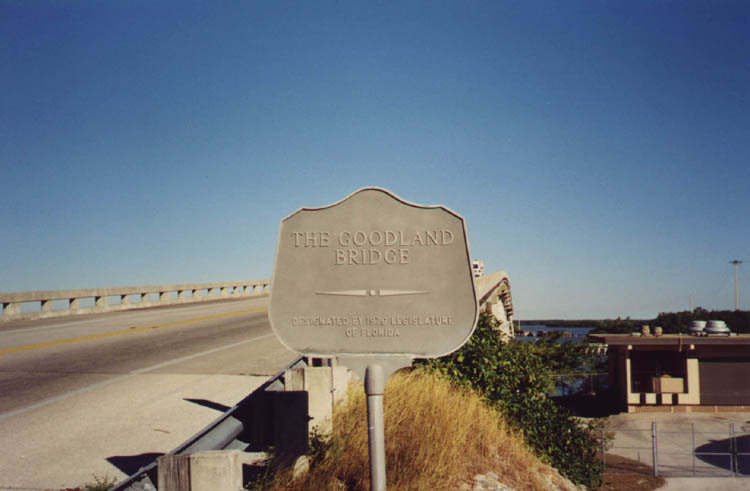 Lowering from the Goodland Bridge, CR 92 (San Marco Road) intersects the west end of CR 892 (Goodland Drive). Photo taken November 1999. Long since replaced, a Florida Keys shield for CR 892 south dated from when Goodland Drive was a state secondary road. Photo taken November 1999. SR 951 shield posted ahead of the CR 92 (San Marco Road) western terminus on Marco Island. Collier Boulevard south of the Judge Jolly Bridge was turned back from state maintenance. San Marco Road was formerly the SR 951 south end. Photo taken 12/30/03. Collier Boulevard leads north to the Collier County mainline, doubling as SR 951 from Big Marco Pass to U.S. 41 (Tamiami Trail). The four-lane arterial parallels the Gulf of Mexico and a number of high rise condominiums southward to the southern tip of Marco Island. Photo taken 12/30/03. County Road 846 joins Delnor-Wiggins Pass State Park and the Naples Park community with Interstate 75. East from Exit 111, the arterial serves a number of golf course communities through to Orangetree and CR 858 (Oil Well Road). Immokalee Road reduces to two lanes north from there, taking a northerly, then eastward course to SR 29 at Immokalee. Collier County 851 is Goodlette-Frank Road, which parallels U.S. 41 just to the east from outside Downtown Naples north to Immokalee Road (CR 846). An end shield appeared for the southern terminus of Collier County 851 (Goodlette-Frank Road) at U.S. 41. Photo taken 01/02/04. CR 862 overlays Vanderbilt Beach Road west from Livingston Road to Vanderbilt Beach through northwest Collier County. CR 864 (Rattlesnake Hammock Road) is an east-west arterial linking U.S. 41 at Thomasson Drive with CR 951 (Collier Boulevard) south of Naples. CR 886 follows Golden Gate Parkway east from U.S. 41 (Tamiami Trail) by Coastland Center Mall in Naples east to CR 951 (Collier Parkway) at Golden Gate. A SPUI joins the arterial with CR 31 (Airport-Pulling Road) and a parclo interchange with I-75 at Exit 105. Both were completed in 2007. Collier County 892 comprises a short spur south from San Marco Road (Collier County 92) to the community of Goodland. It was built as a temporary road because the Deltona Corporation had intended to construct residences and canals on this part of the island. However, that development never took place due to the environmental impact. 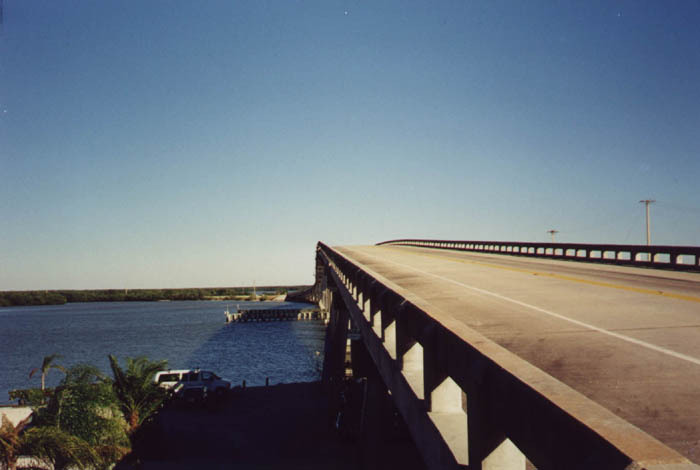 CR 892 (Goodland Road) north intersects CR 92 (San Marco Road) at the west end of the Goodland Bridge across the Big Marco River. Photo taken 12/30/03. Old Florida 92 and faded orange U.S. 41 markers at the west end of CR 892 (Goodland Drive). Photos taken November 1999. Collier County 896 follows Seagate Drive east from Clam Pass Beach to U.S. 41, and Pine Ridge Road, a six-lane divided arterial connecting Tamiami Trail, Airport-Pulling Road (CR 31), Interstate 75 and Collier Boulevard (CR 951) across the northern tier of Naples and Golden Gate. Several shopping centers line the route, including the Waterside Shops complex at the northwest corner of U.S. 41 and Seagate Drive. Growing traffic demands on the commercial arterial led to discussion involving the congested intersection with Airport-Pulling Road, including a grade separation. Replaced shield assembly on Collier County 896 (Seagate Drive) east at U.S. 41 (Tamiami Trail) outside Naples. Photo taken November 1999. County Road 896 (Pine Ridge Road) east at County Road 31 (Airport-Pulling Road). This busy intersection was once considered for a grade separation. Photo taken November 1999. Commercialized frontage lines Pine Ridge Road to the diamond interchange with Interstate 75. Photo taken November 1999. CR 896 (Pine Ridge Road) east the southbound on-ramp for I-75 to Fort Lauderdale and Miami. Photo taken November 1999. Collier County 952 spurs west along Tarpon Bay from Florida 951 (Collier Boulevard) to the Isle of Capri. CR 952 (Capri Drive) east at Florida 951 during expansion of Collier Boulevard to four lanes. Photos taken November 1999. “Governor Scott Highlights I-75 Widening Project in Collier County.” State of Florida, news release. July 30, 2015. “New interchange opens on I-75.” WBBH (NBC-2), March 13, 2007. “Green Light: Immokalee and Collier Blvd. Improvement Projects Begin.” Naples Herald, May 9, 2016. “C.R. 951 extension considered to ease traffic burden.” Fort Myers News Press, March 20, 2015. “In the Know: History behind road names in Naples area.” Naples Daily News (FL), May 4, 2015. “Golden Gate Parkway overpass proving to be a time-saver, drivers say.” Naples Daily News, March 14, 2009. CR-92 San Marco Road over Marco Channel. BridgeReports.com. Page Updated September 18, 2017.